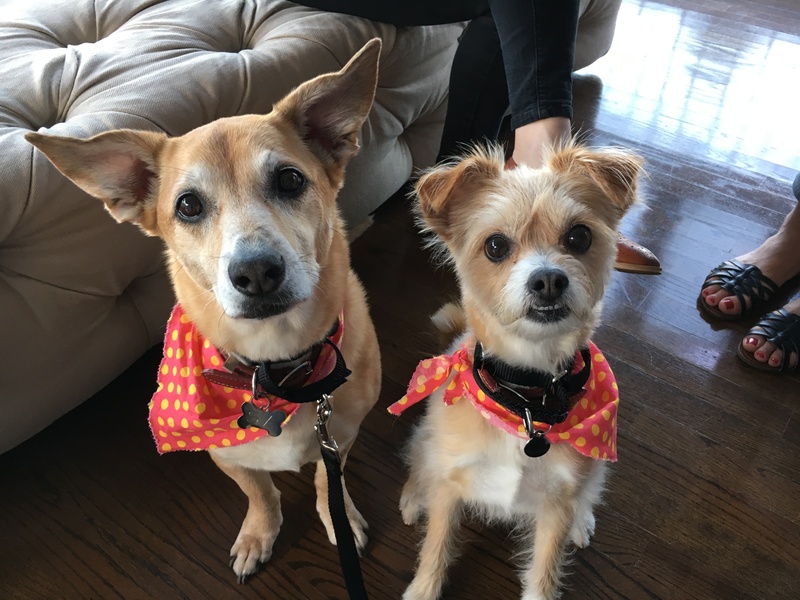 Sia (left) is an eleven-year-old Carin Terrier Mix who lives in Los Angeles with Ty, a seven-year-old Chihuahua Mix. Their family set up a dog behavior training session with me to stop dog barking and get them to stop pulling on the leash. After chatting with the guardians and observing the dogs, I learned that the dogs didn’t have much structure in their lives. As a result they had come to the conclusion that they held the same authority as the humans. Seeing the humans as peers meant that the dogs considered listening to them as optional. As a result, when the humans disagreed with the barking, the dogs ignored them. While the dogs did some barking with the humans there (to passers by and unknown noises), the complaints from the neighbors occurred when the humans were away at work. As a result, the guardians started putting down the dog door when leaving the home. Both dogs are related to breeds known for barking, but the real reason for the outbursts was the lack of rules and boundaries. As I mentioned earlier, this caused the dogs to see themselves as being equal to the humans. When a dog see’s itself in a position of authority, they start acting like a leader. Leader dogs are often in charge of security for the group. This is one of the biggest factors for the dog’s barking. To help stop the dogs from reacting to sounds that occurred when the humans were home, I demonstrated a simple counterconditioning exercise. I had one of the guardians head outside and ring the bell / knock on the front door like a guest would; an activity that normally resulted in several minutes of barking. But by delivering a positive reinforcer before the knock was heard, the dogs didn’t respond at all. We practiced this for a few moments to make sure the humans had the technique down. The humans will need to make a list of all the sounds and sights that trigger the dogs to start barking, then systematically countercondition the dogs so they no longer respond to them. While the counterconditioning will greatly reduce the barking when the humans are home, its going to take the family constantly enforcing the new rules and boundaries before the dogs get the message that their security dog jobs no longer need their services. I shared some ways to deliver their messages through non verbal communication cues, then introduced a Leadership Exercise that helped the humans practice using them. The exercise involves placing a treat on the floor, claiming it as a dog would, then moving away in a structured way. Only once the dog has given up on taking the treat without an invitation does the human let the dog have it. This way the dog understands challenging the human wont work but surrendering to them is rewarded. After we wrapped up the leadership exercise, I showed the humans how to claim the area around the door before opening it when a guest arrives. After demonstrating it myself, I coached the members of the family through it until they got the same results. Seeing the dogs stay back and barely bark was impressive to their guardians and is a good sign that means these problems are entirely fixable. We finished the exercise by going for a short walk so that I could show the humans how to teach the dogs to walk with a loose leash. This leash training is something most people don’t do, but unless we teach a dog how we want them to behave during a specific activity, its our fault when they pull on the leash. By the end of the session, the dogs were not barking at all when we knocked on the door or when people passed by the house or they heard unknown sounds. They were also listening to the humans and looking up to them for direction and guidance. While we made great progress in the session, its going to take consistent practice from the humans to make these new behaviors permanent.